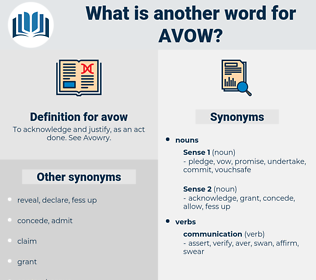 What is another word for avow? understate, confute, negative, dispute, counter, disprove, neglect, gainsay, challenge, minimize, overlook, abandon, rebut, disregard, ignore, question. 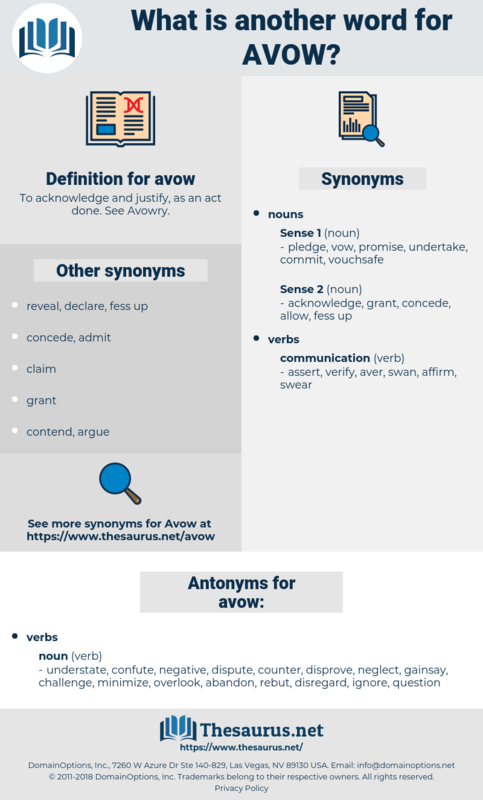 You're a tactful young person, I do avow. D. You praise the life that people lived of old, When Rome was frugal and the age was gold, And yet, if on a sudden forced to dwell With men like those, you'd strenuously rebel, Either because you don't believe at heart That what you bawl for is the happier part, Or that you can't act out what you avow, But stand with one foot sticking in the slough. aby, av, afp, abye, ape, a few, abaya, avo, abo, abbe, apia, ahab, above, avahi, aba, Abb, ab, abbey. tell, attest, protest, assure, claim, hold, take, declare.